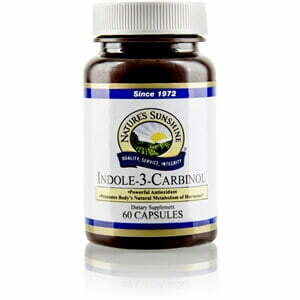 Nature’s Sunshine Indole-3-Carbinol may protect the cells from oxidative damage. A powerful antioxidant, indole-3-carbinol is a substance taken from cruciferous vegetables. Along with the other compounds found in these vegetables, indole-3-carbinol stimulates receptors in the body to provide protection for cells. It may also assist in metabolizing estrogen and protecting reproductive organs and breast tissue from damage. Blended with a base of broccoli sprout and broccoli powder, Nature’s Sunshine Indole-3-Carbinol includes 200 mg of total dietary indole content.